Puerto Vallarta, Mexico, is well known as a popular beach destination for Americans and Canadians. Many of its restaurants are also well known to discriminating diners. But sometimes it pays to just stop where you see the crowds and wait in line for a tiny table at a popular taco stand. That’s just what we did on our latest trip to Puerto Vallarta. Along Basillo Badilla about 7 p.,m, on a Thursday there was a crowd waiting patiently outside Pancho’s Takos. But that wasn’t the only thing that drew our interest. 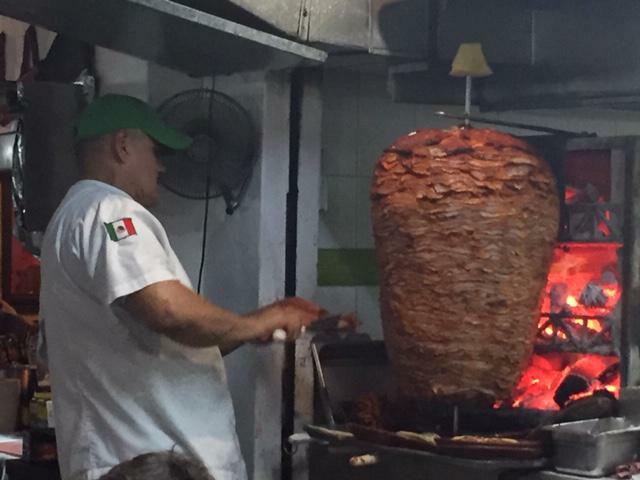 The clincher was the giant spit of marinated pork being sliced for the house specialty, tacos al pastor. The man doing the slicing didn’t take a break. 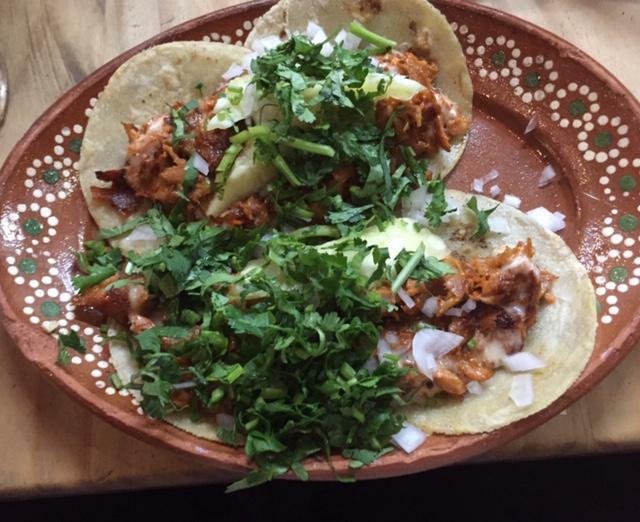 The taco meat was juicy and succulent, the tiniest bit sweet with heaping amounts of onions and cilantro. The quesadilla filled with crumbly chorizo, also accented with cilantro and onions, was another hit. All the tables also got a tray filled with chopped limes and salsas for extra flavor. I didn’t feel the need. This is not fine dining in an intimate, quiet space. In fact, it’s almost circus like with folks walking by and street performers a few steps away. But the food was definitely fine, and worth a repeat trip.